ALOHA! Immediately as you enter the home your attention is drawn to the vast ocean front windows and sliding glass doors that lead out to the huge deck. Here you can spend endless hours enjoying the cool breezes from the ocean, sipping on a morning cup of coffee or watching spinner dolphins and whales playfully swim by. During whale season, there may even be nights when you can hear the whales singing. 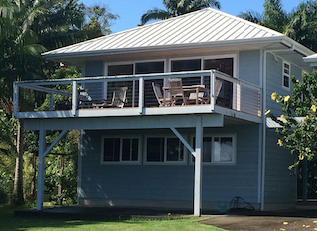 We have made this quaint piece of paradise available as a vacation rental and at a very economical rate. We realize that so many ocean front homes set their rates out of range for many travelling couples and small families. We feel as though the Loft at Pali Lani is the perfect, unassuming option for those desiring to be ocean front yet not wanting to break the bank.